Decimal Halfpenny coin cufflinks available by year: 1971,1973,1974,1975,1976,1977,1978,1979,1980,1981. 1979 is a 40th birthday. 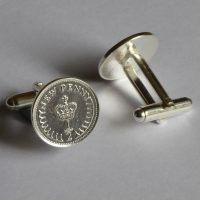 Solid Decimal Halfpenny Cufflinks-Coinwear. This small coin makes a perfect cufflink. The Decimal Halfpenny coin cufflinks are available in 1971, 1973, 1974, 1975, 1976, 1977, 1978, 1979, 1980 and 1981. Diameter: 1.71cm. The year is on the reverse side of the coin.